The FIBA Europe U16 European Championship for Women Division B in Arad came to life on the quarter-final day with some remarkable individual performances. England are the only traditional Division B nation remaining in the championship. They beat the hosts (63-50). Leading (19-7) after the first quarter, a three-ball by Shequila Joseph at the start of the second quarter gave the guests their largest advantage. Although England was never in trouble they did give their coach some worries. They hit just 9-from-22 at the free-throw line and turned the ball over 27 times. Romania had similar problems on the free-throw line with just 12-from-25. In the end, England's better three-point shooting and dominance of the offensive boards made the difference. Joseph finished the game with 20 points. Leah McDerment who is playing in her third U16 championship contributed 17 points. Cheridene Green was the other player in double digits with 10 points and 16 rebounds. Germany managed to hold on to their unbeaten record with an overtime victory against Ukraine (85-79). Noémie Rouault (left) who scored 28 points for Germany and picked up 14 rebounds saved Germany from elimination with the shot that sent the game into overtime (76-76). Germany led (54-46) going into the final quarter. But with 10 points coming from Nataliya Skorbatyuk Germany's advantage reduced to 4 points (61-56) with six minutes to play. Skorbatyuk scored 21 of her 25 points during the fourth quarter as she single-handedly took on Germany with an excellent display in three-point shooting. 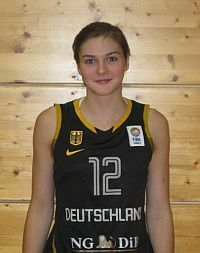 However once the game went into overtime Emma Stach (in picture) who also finished with 28 points for Germany and Rouault shared the first 8 points which ended the Ukraine resistance. Germany last won promotion in a FIBA Rurope U16 event in 2007 when they came second to Italy. Latvia's last appearance in a Division B semi-final was in 2006 when they won promotion to Division A. They returned back to Division B in 2009. Lithuania had looked good during the early stages of the competition and had come into this game as the favourites. Yet 20 minutes into the game Latvia led (40-20). By the end of the third quarter the contest was over with Latvia (59-34) in front. Lithuania made a fight of it during the final quarter. But it was just a case of too little too late. Kata Karalina Kreslina's three-point shooting (4-from-5) was a key factor in this game. She finished with 12 points, second to Ieva Spigule who had 16 points. Bulgaria made up a 11-point deficit going into the last quarter to beat Portugal (61-59) in the dying seconds with an AND-1 play by Iva Georgieva. However the hero of the day for Bulgaria was Borislava Hristova who scored 30 points.